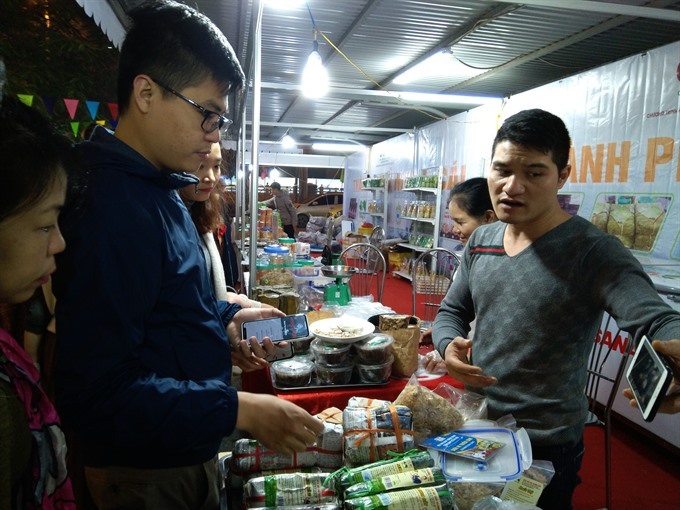 HÀ NỘI – Food and typical products from Quảng Ninh Province are on display at the “OCOP Quảng Ninh Fair – Spring 2019” at Big C Thăng Long in Hà Nội. This fair aims to introduce and stimulate consumer interest in products from the province in the framework of the national One Commune One Product (OCOP) programme. The fair includes 63 pavilions offering more than 220 products, including Golden flower sticky rice (Nếp cái hoa vàng), wine made from rice and fruits, pork, salted pig’s feet, spring rolls, wild honey, flower and herbal tea, fresh asparagus, square glutinous rice cakes (bánh chưng), seafood and fine arts and ceramics. According to Đặng Huy Hậu, Standing Vice Chairman of Quảng Ninh People’s Committee, about 322 products of the province have participated in the OCOP programme, a significant development compared to just 48 products in the first year of its implementation in 2013. All OCOP products are granted certificates of food safety and hygiene and more than 90 per cent of products have origin-tracing stamps. About 140 products are verified with 3-5 stars for quality. “This fair will be an opportunity for OCOP businesses and cooperatives in Quảng Ninh Province to directly introduce and promote special products with high quality and clear origin to consumers in the capital city,” Hậu said. Philippe Broianigo, CEO of Central Group Vietnam, said in August last year, the company recommended to the Ministry of Agricultural and Rural Development (MARD) and the Central Coordination Office on New Rural Development to become a partner of the national OCOP programme as being an outlet to promote the sale of OCOP products to customers.